In a surprising turn of events I have ordered a bunch of reading for fun. While it definitely seems like one of the last batches of actual paper books I am buying, they still worth the reading. The Emotional Intelligence Quick Book – everything they say in this book is so obvious I’m almost positive you have never thought about it. And once you start thinking about it – you realize how much you have been missing. The book I linked to above is an older version (my professor recommended it), but there’s a newer version of the book available, called Emotional Intelligence 2.0 . As far as I know they significantly overlap, but since I haven’t read the second I can’t really tell which one is better. From my point of view – as long as you get one of them you should be all set. The book talks about Emotional Intelligence in all aspects of life – personal, career, family. Unlike other, more systematic books, this one doesn’t provide with any recipes or formulas “Do this umpteen times and you get a promotion”. It rather points to the reader himself in an attempt to stimulate observations and monitoring. Like in that story, where the patient says “Doctor, when I do this – it hurts”, and doctor responds “So don’t do this” – that’s the only recipe in the book, but what the book does good is it dissolves complicated cases to reveal what is it that you do that make you hurt. It’s an easy reading, so I highly recommend it. Also, including with the book is a code for online emotional intelligence EQ test, so if you want to know where you stand – give it a go. Last week the Crunch gym that was conveniently located downstairs in the same building where I work suddenly moved. E-mail came in on Tuesday stating that starting Tuesday the gym is located within 15 minutes from the previous place, everybody’s welcome. Now, that’s what I call a good customer service (note: this is the case of heavy use of irony). Crunch offered 3 months of free membership while at the same time upgrading the existing members of that location to all-locations membership at the previous discounted rate. However, a 20 minute travel eats out of workout time, not work time. I got concerned and started visiting other nearby gyms – to see if I have any alternative. The closest one was NY Health & Racquet Club. Conveniently located within 3 minutes of walking time, it was an obvious choice. The drawbacks were a bit messy appearance, a bit too crowded cardio floor and narrow staircases between gym floors. However, nice sales reps, swimming pool with jacuzzi and attendants in the locker rooms made up for it. Next on my list was the other Crunch location (where they actually moved to). I figured if I could work out after hours, it might be still better, plus I got a bit lower rate. However, lack of the pool, just the same amount of mess and cardio machines packed a little too tight made that a “NO”. Additionally, there was no guarantee that this new gym would not go yet another place overnight again. Another one, within about 5 – 6 minute walking distance, was NYSC – New York’s sub-network of of a larger network of sports clubs. Being regarded as “Manhattan’s Bally’s” the gym truly stood out – in a bad way. I’ve spent about 10 minutes waiting for someone to come up to me and at least greet a potential client. Cleaning lady seemed to be the friendliest person to be found, as she was asking if I needed anything to dry out (I came in from the rainy outside without an umbrella). Ten minutes later the sales rep appeared, but figuring I am coming from corporate account he’s got nothing to sell me, he quickly vanished again, saying that another guy will take care of me and show me around. That another guy was, actually, a nice person, but having waited for him yet another 10 minutes while he was finishing the conversation with his colleague was in no way fun. I don’t know how traders react (the gym is located right on Wall Street), but I had enough patience to actually wait out till the end. He showed me around briefly, but I already disliked the place – because of the customer service. I don’t ask for much, but a simple courtesy of not wasting my 20 minutes on just waiting – that’s too much. Also, sales reps were boasting about having a pool as being a privilege of off-the-work gyms, rather than ones that are in the city. Too bad, as a sales person is such a dense area you should know your competition better. It really doesn’t cost a cent to send someone down the Broadway to check out three other gyms on the street. Takes one person less then 2 hours. So there I was, left pretty much with only one choice on the list – New York Health & Racquet Club. The gym won without really trying, with their old-fashioned approach when sales woman talks to the guy and sales guy talks to female client definitely had added more positive influence (I liked that sweet girl that showed me around), the gym with the pool in Downtown Manhattan is definitely a plus and it’s the closest one I have found. Now why all the trouble if I could’ve just went to NYHRC and not waste my time on gym visits? Well, for one – I am serious about my workout and I really do put a lot of time and effort into it. So I want a place where I would want to go to, with good atmosphere. Second – I workout during the day, so I need to spend on “other stuff” (like waiting for showers, equipment, lockers, etc.) as less time as possible, maximizing the workout time – this ruled out new Crunch location. Third – I want nice people around me. Most gyms in Manhattan keep a certain level of professionalism, where they treat the client as a decent human being. I haven’t seen that at NYSC. Overall, I spent less than 2 hours on all three gyms, did my homework and made the best decision I could – based on what people who wanted to sell me a membership had showed me. What does your sales person actually show to your prospective clients? This is part II of the series (read Part I of Self-Improvement for Small Business Owner). When you talk or read that goal management is good – you are not making any real progress. Even more so – the more you talk, the more you waste your time. So if you really want to start going – here’s a first step at organizing your goals. This colored thingy is already broken down into 9 color-coded areas. 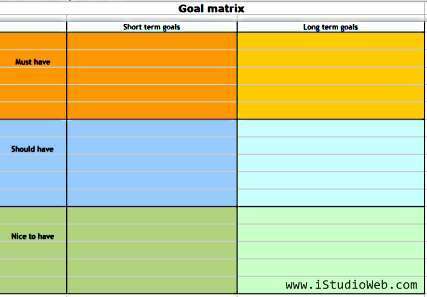 Once you write your goals in each of the areas, you should start associating your goals with these colors. Now, I am not saying you should use these colors to brain wash yourself, however, if you feel certain colors would represent your goal/priorities better – feel free to copy this chart into Excel or Calc and change them around. The idea is to have three colors for each priority and distinguish between a long and short term by intensity (saturation, if you will) of the same color. Why? Good question. Ideally, your short term goals must lead you to achieving your long term goals. So by coding short-term goals in the same color as your long terms you implicitly suggesting to yourself that that’s why you are doing this. As an example, take running 10K distance (that’s one of my long term goals for now). I know that I can’t just get up and run 10K, because somewhere around 3 – 4K distance I break down. So I set a short term goal to get an extra 5 minutes to run every week. During my workout yesterday I had a 30 minute run instead of 25 as of last week and I have successfully broken my dreaded 4K barrier. Maybe I stick to 30 minutes for the next week or maybe I will increase it to 35. In any case – running an extra 5 minutes makes a perfect deep-blue colored short term goal, at the same time reminding me that colored in sky blue goal of running a 10K run is getting closer every time I achieve my “+5 min run”. Aside from that there is one more use for this matrix, which I will talk about in the next part of the series. Stay tuned.